Here's a quick look at our Upcoming events. Click on a title or scroll down the page to see detailed descriptions for each event. Ongoing events include Lunchtime Fiber every Tuesday and Thursday from 10 am to 2 pm. 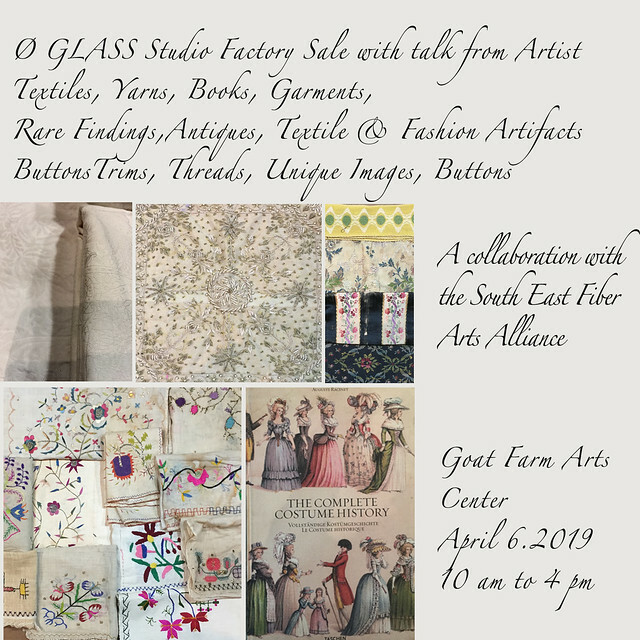 These events are free, open to everyone and or the perfect opportunity to relax, meet up with friends, and work on a current fiber project or weave on the SEFAA Center loom. Come often and whittle down that list of UFO's (UnFinished Objects)! American Craft Council Show - Look for us in the demonstration area where we'll be showcasing many different fiber techniques. 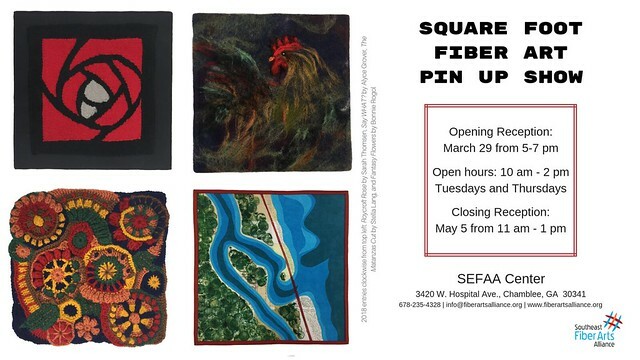 Square Foot Fiber Art Pin Up Show - A month-long exhibition of small works of fiber art. Open to everyone, unjuried, and tons of fun! 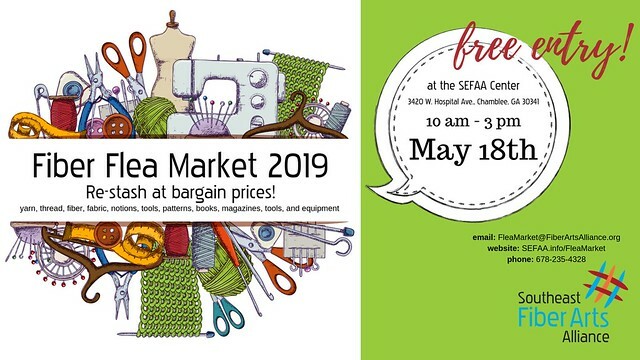 Fiber 'n Fabric Market - In May or June, shop for bargains on materials, supplies, equipment, books and magazines, handcrafted items, and ethnic textiles. If it has to do with textiles, you can find it! 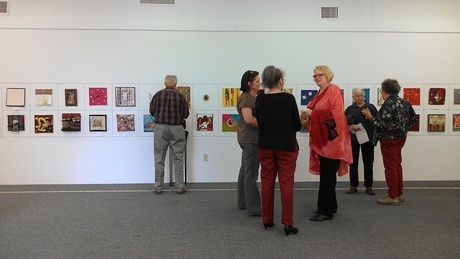 Artists' Sale - Early November is your chance to shop for exquisite handmade textiles and fiber art made for you by SEFAA members. Ø GLASS, is the eco, social-purpose brand developed by Karen Glass, and on April 6th, Karen will welcome us to her studio. She'll talk about her brand and her work and walk us through her line and some current pieces. Then, since Karen's focus is shifting to the development of her Ø archive and Ø 2 series, we'll be able to shop her sale of studio fashion and textile artifacts, including hundreds of fine textile remnants, design inspiration pieces, yard goods, garments, accessories, fashion and textile books, trims, unique threads, buttons, and hand-collected animal hair fibers! Best of all, Karen is generously donating 10% of the sale proceeds to SEFAA. Don't miss it! Vendors: All tables have been sold. 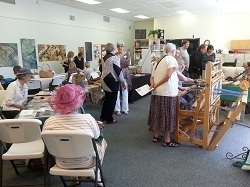 Please email info@fiberartsalliance.org to be added to the wait list. 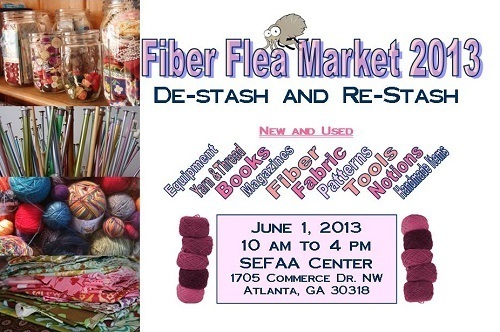 Volunteers: We need your help at the Fiber Flea Market. It's the perfect excuse to stay longer! Sign up today at: https://sefaa.info/FleaMarketVolunteer. Our second annual garage sale with a new, upscale name and a new location. This amazing semi-permanent fiber art installation is in the Berkeley Heights Shopping Center at the corner of Northside Drive and Bellemeade. Had so much fun we forgot to take any pictures!